This special formulation is the most comprehensive hemp product we know of. CO2 Hemp Extracts- 50:50 blend of Raw and Heated cannabinoids (i.e. CBG-A:CBG) and Steam Distilled Hemp Extract high in terpenes. This Hemp Extract blend is a special formulation of various different hemp extracts high in terpenes. 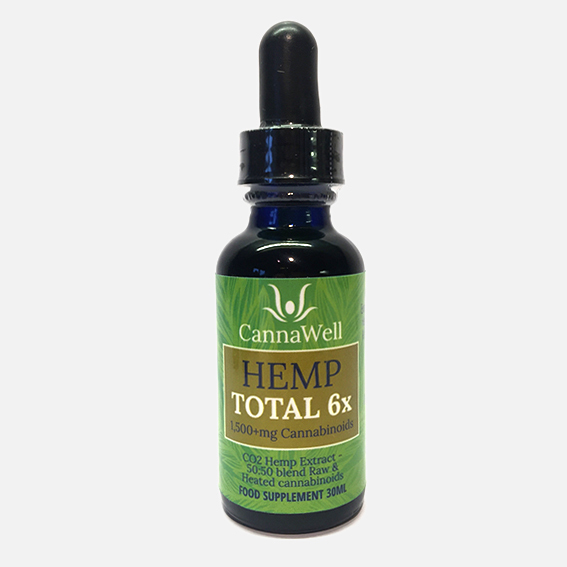 As opposed to Cannawell’s Hemp PURE, Hemp TOTAL contains both the decarboxylated (i.e. CBG) and non-decarboxylated/raw (i.e. CBG-A) forms of cannabinoids, in a 1:1 ratio. In addition Cannawell have also included a steam (water) distilled hemp extract which contains a significant amount of additional therapeutic constituents known as terpenes. Their steam (water) distilled hemp oil contains at least 26 different aromatic terpenes plus various aldehydes and ketones. Take 15 drops per day, more or less, as desired. 15 drops contain 25+mg cannabinoids & terpenes. The amount of Hemp TOTAL 6x that people take on a daily basis can vary greatly. It can be taken day or night, before or after a meal. Best kept refrigerated (can be left out of the fridge, too). Consume within 6 months of opening.